STOP HS2 | Case for HS2 hit by recession in long distance travel and boom in home working. This week, two reports have been published which hit hard at the case for HS2. Firstly, the Office for National Statistics has shown that 4.2 million people, or 14% of those in employment now work from home, whilst the Office of Rail Regulation has shown long-distance travel dropping for the second quarter in a row to 4.8 billion passenger kilometres. 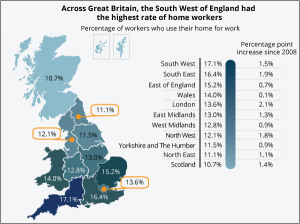 When the ONS first started compiling figures for home working in 2009, there were 2.9 million home workers (11.1%), but since then the growth of the internet has meant those in higher paid occupations and managerial positions now make up account for 73.4% of those working from home. HS2 is of course intended to do little in itself to relieve pressure on commuters going in to the office each day, as it delivers capacity where it is least needed, on long-distance rail routes. The fact this is not where capacity is needed has been demonstrated by the latest set of figures from the Office or Rail Regulation, which showed that long-distance passenger kilometres dropped last quarter (2013-14 Q4) from 4.9bn to 4.8bn. In 2013-14 Q2 the figure had been 5bn passenger kilometres. With two consecutive quarters of falling figures, the number of miles travelled by long-distance passengers is in recession for the first time in eleven years. While the number of fourth quarter long distance passenger journeys has risen slightly from 31.1 (2012-13) to 3.13 (2013-14) million journeys, this number is still below the figure from two years ago (2011-12) of 31.9 million journeys, showing that long-distance passenger numbers have stagnated. In contrast, short distance commuter journeys within London and the South East, which make up over 70% of all rail journeys in the UK, have continued to rise. IN VIEW OF THE DISGRACEFUL FIASCO OVER THE TRAM SYSTEM IN SCOTLAND I BELIEVE MORE THAN EVER WE HAVE A RIGHT TO SEE THE ‘HIDDEN’ RED/AMBER REPORT ON HS2 BEFORE OUR IDIOT REPRESENTATIVES WASTE MORE OF OUR MONEY AND RUIN LIVES. WHY SHOULD WE RESPECT THESE PEOPLE WHEN THEY SHOW SUCH CONTEMPT FOR US AND OR LIVES? THEY ARE NO ONES, NO BETTER THAN ANY OF US.THE ELECTION RESULTS I’M SURE WERE NOT JUST ABOUT IMMIGRATION BUT ALSO ABOUT GREENBELT, HS2 ETC.I FEELTHE PARTY WHO OVERSEES THE HS2 NONSENSE IF IT GOES AHEAD WILL NOT BE RE-ELECTED FOR SOME TIME! THE TRAMS FIASCO AND HS2 MAy END UP IN THE NEXT VOLUME OF ‘THE BLUNDERS OF OUR GOVERNMENTS’ BY CREWE/KING. A GOOD READ. Westminster and Lay MPs in 2015 is not the way to resolve the issues with the central open county section of Route 3. If HS2 and its consultants made so many people petition to protect their homes, villages, communities, businesses and farms how can 6 lay MPs provide the solutions to these matters. They cannot and should not. Route 3 central county section is now represented by many people who have like many in the second World War decided to join up and petition. What will be their D-Day action to take on this tyranny of mistaken transport and countryside planning resulting in one of the most restricted railway propositions that must have Brunel and Stevenson turning in their grave with another 35,000 and the Romans in their Burial locations. The Route 3 has been badly planned and the worst impacts are on people the worst impacts are at small villages such as Chetwode, Twyford. Calvert, Quainton and along Aylesbury and Stoke Mandeville. The UK and British cannot manage renewing technology and rail infrastructure well as was found with MPA IT projects and WCML upgrade. The involvement of politics whether from Labour in the time of Railtrack was as Byers and Hoon/Adonis have shown not suitable for select and sub-committees. Time for the powerful people of the nation to call the political contributions to designing and planning large schemes to and end for civil servant groups and their siamese twinned temorary MPs. If UKIP declare to remove the false belief that politicians without the competencies and experience of running industry should NOT interfere in complex projects it is likely the UK can start moving from dysfunction and bad decisions. D-Day brought out the collective resources to stop tyrany and a the many petitioners and many more people in the UK who find it unbelievable that a few MPs who never designed or planned infrastructure themseleve want to spend over £50B of your taxes and foreign debt on this very poor rail proposal. D is for the disappointment and despair the Cameron, Clegg and Miliband have not the courage or sense to stop this mistaken Route 3 across the counties and sub-urban areas for no benefit to the local people. Expropriating land in the Second world war was accepted for the greater good. This is not the case for the Hybrid Bill. Vote in 2015 to demonstrate your disapproval to this form of governance that has failed on a count of petitioner and the silent but majority bewildered British people generally.